Have you ever had a preconceived notion blasted out of existence? I find myself guilty of making assumptions about people and situations way too often. And then, the reality I was so certain of gets blown out of the water. Usually, it’s me being small and covetous. Being judgmental is just me wishing the crud in my life wasn’t. It’s me thinking life isn’t fair. Most of us put on our game face, our fake smile, and do our best to look perky, energetic and do what needs doing regardless of how crappy we might feel or how heavy the world weighs on us that day. A few people will see through our façade. But we manage to fool most of them and think our life is great. You gotta figure everyone else does what you and I do. Everyone else has on a game face for the world to see. At home, the reality could be filled with tears, anger, and worry, much sadder and more desperate than we could even imagine. That perfect little family down the street might be struggling with someone dying of cancer. The co-worker who seems to have it all together may be losing everything he’s ever worked for. The adorable Barbie-figured woman who jogs past your house every morning may be on her last gasp before running away from it all. The quiet, unassuming kid behind the counter who’s always polite to everyone, might have plans later that end it all. Ah. You never know. Until it’s too late. Even then, you may not know. 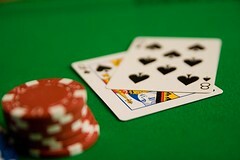 The cards we get dealt in life are ours to play however we choose. We can let everyone see what hand we have. We can hold ’em close to our chest and not divulge a thing. We can have a poker face that discloses nothing.We can bluff our way through and have everyone fooled. Only we know what we’re playing with. Why I’m using a card metaphor, I’m not sure. I think it’s a big cliché’. And, I’m a lousy poker player. And, I only play for chips, for fun, for the laughter. Hopefully, I play out my life better than I play cards, or write. I’m reminded today that I can’t guess at what anyone else has in their hands, in their hearts, behind their door. I can only wish them the best, help when I can and be kind to strangers. What’s that quote? It’s attributed to a few different people. But whoever said it, said it well and was wise. I, for one, am going to try to be a little less judgmental, a little kinder, a bit more gentle. I want to give others credit for thinking through their circumstances and doing the best they can with what they have. Maybe you’re the one fighting the hard battle. If so, you can be kind to yourself. Give yourself some slack, do a little something that feeds your heart and mind and soul. If you’re one of those fighting a hard battle today, know that you are not the only one doing so. I don’t know if that helps or hurts. I do know that I wish you strength, energy, hope, happiness, coping ability, love, recognition of small joys, and the perseverance to keep moving forward. It’s Gratituesday! Today I’m thankful for the tiny green shoots of wildflowers I have popping out all over my front yard. There’s a promise in those sprouting weed-like growths. I know even though they look like weeds, and grow like weeds, they aren’t weeds. They’re going to produce masses of yellow and orange African Daisies and bunches of satiny orange California Poppies in another four to six weeks. To appease the HOA I set out a couple of signs that say, “Wildflowers Under Construction.” I don’t really want to pay a fine for my “weeds” or get out some mean weed killing chemical. I want to see the yard burst into golden waves of color. I find the symbolism of these flowers particularly appropriate for the challenges I face in my life, large or small. What appears as something terrible, something troublesome, with time, often, not always, but often, in the long run becomes something positive and memorable. I’m not about to proclaim gratitude for trials, oh no, not me. But I am willing to concede that I learn from going through hard times. There’s a beautiful song, written by Stephen Foster, which I found particularly moving a few years back when the tides of trouble breached all levees and inundated my life. It became an anthem for me of sorts, or a prayer, which I still hum often and think out loud and verbalize while on my knees. For me, as for many, if not all, hard times are not a one time event. Hard things press in on us and weigh us down with a weight that is unfathomable. Finding a small thing like the shoots of wildflowers pushing through the weight of rocky soil can bring hope and send a song through the air that lifts the weight ever so slightly. I look for signs of hope all around me. Not just in springtime harbingers, but in everyday life. A newborn’s mewling cry. A teen’s energetic laughter. An older couple holding hands. Help being offered when a need presents itself. Kindness extended, smiles proffered, handshakes offered. Birds chirping. A toddler’s rowdy chaos. Blue skies. I want to put a “Wildflowers Under Construction” sign on the doors of certain houses that I know. I wish them vision to see the shoots of green that are pushing tentatively up through the rocky ground they’re walking on. I want them to hear the song of hope, however quietly it may lilt in the air. I pray they feel a gentle tug of hope encircle and lift when all seems lost. I watch for hope, for signs of life and laughter and good things to come. Being small, they aren’t always easy to see. You have to look closely. They’re everywhere, can you see them?